Over the course of his 50-year career, the American photographer Edward Weston (1886–1958) blazed a trail into Photo-Modernism, capturing portraits, landscapes, still lifes and nudes that have established him as one of the most revered proponents of photographic art. In 1902, when he was living in Chicago, the 16-year-old Weston took up photography as a hobby, and it soon consumed most of his energy. At the age of 20, he moved to Tropico, California (now Glendale, Los Angeles County), where he built his first studio and with great purpose set about becoming a photographic artist. An examination of Weston’s sharp- and soft-focus photographs of this period reveals that he was already exhibiting the perfect sense of composition that became his hallmark. 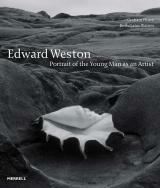 Presenting Weston’s earliest images as preserved in a series of family albums assembled by Flora, his first wife, Edward Weston: Portrait of the Young Man as an Artist compares Weston’s first naive photographic efforts with his later masterpieces, demonstrating the persistence and evolution of his singular vision to find essential form in the vernacular with an ever-increasing intensity. Weston’s early compositions, beginning with his teenage snapshots, reflect a young man who was deeply intuitive and original in his creative expression, and simultaneously embrace the same significant form as the later photography for which he is now considered a master. Graham Howe is the founder and CEO of the Pasadena-based arts organization Curatorial Assistance, for which he has curated and toured several hundred exhibitions. He was previously founding Director of the Australian Centre for Photography, Sydney; Curator of the Graham Nash Collection; and a visiting curator at the Museum of Contemporary Art, Los Angeles. He is the biographer of the American photographer Paul Outerbridge and the German-born British Photo-Modernist E.O. Hoppé.